Manchester, NH First Pedi Cab! We are 100% human powered transportation. We are also Manchester’s first pedicab! We are a driver-for-hire service that is focused in Manchester’s downtown, the Millyard and Ballpark district. Our cabs are all 100% carbon emission free and operated by professional pedicab operators. Our pedicab drivers are licensed with the city of Manchester, NH. Using our eco-friendly, open-air person powered pedicab, you’ll enjoy a smooth and safe ride. These three-passenger vehicles are equipped with safety belts, headlights, and flashing tail lights. Our drivers provide friendly service and knowledgeable information about the city; don’t just drive through Manchester, feel its pulse. We’ll get you to where you want to go in style! This wild journey of becoming the owner and chief executive at Peddl quickly started after submitting my #CrazyMHTIdea in August 2018. We officially launch September 21, 2018. In addition to opening Manchester’s first pedicab I also run a Martial Arts studio and worked for several years supporting entrepreneurs in getting off the ground at the Alpha Loft. I am of the belief bicycle’s should be part of everyday transportation. With my love for biking and the entrepreneurial spirit of Manchester, Peddl is going to be great for MHT. Safety is a top priority for me, our pedicab was created by MIT grads and is equipped with great safety features. We are located in downtown Manchester, NH. Check out social media to learn when we are out today or reserve your ride by texting 603-489-6061 or email Mike@peddlmht.com. While business hours can be irregular due to weather or other limitations, we can be available anytime, given proper notice. Want to ride to your next meeting in style or find some good local grub before you see a show? Scheduling a pickup is easy. Just text 603-489-6061 or email Mike@PeddlMHT.com! We do encourage advanced notice to ensure that we have drivers ready to roll. 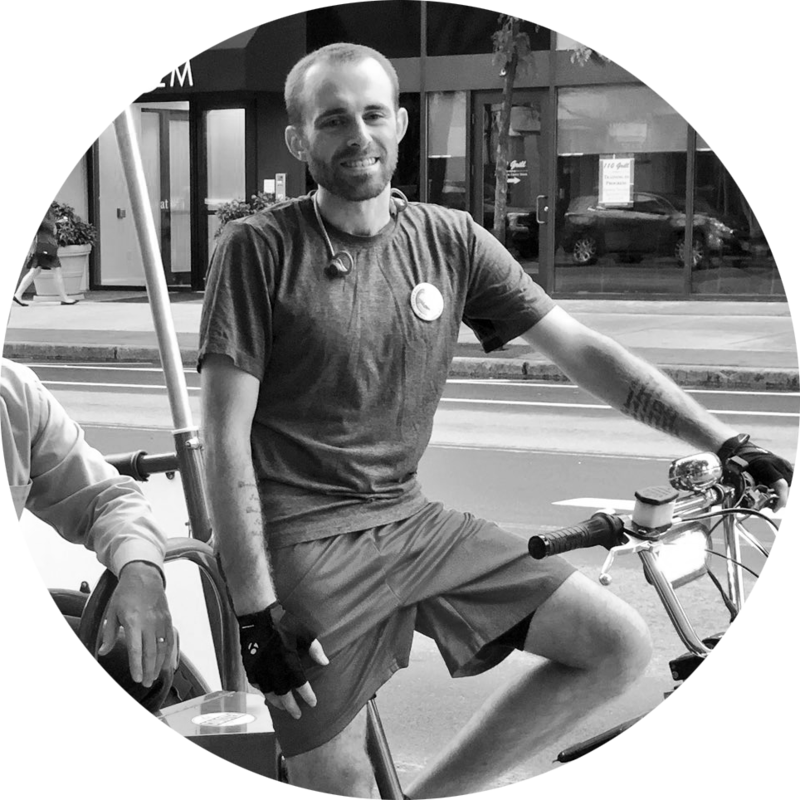 Our drivers are independent pedicab drivers that work for tips. The suggested price is $1/block. Consider amount of passengers, ride distance, experience and terrain. Cash and cards are accepted at the end of your trip! There is no set rate for regular (non-tour) rides. That means you get to make up the price. You read correctly! You decide what you want to pay. What’s a fair payment in this flexible “open fare” system? Our drivers are independent pedi cab drivers that work for tips. The suggested price is $1/block. Consider amount of passengers, ride distance, experience and terrain. Looking to schedule a driver for a meeting or lengthy ride. Drivers can be reserved for 30 & 60 minute increments. You can reserve your driver at a rate of $75/hr + tip. Our pedicabs are designed for two or three adults (sometimes it gets a little cozy with three), or two adults and two small children. There is ~ a 500lb limit. How Do YOu Deal with mother Nature? If there’s steady rain, snow or ice, we may stay home just like you do. (But sometimes, on hot summer days, riding in a light shower is actually tons of fun.) On cooler nights, most of our pedicabs will have snuggly blankets on board. We Customize to your style and event! Have a special birthday coming up? Instead of pony rides go with a pedi ride! Kid and adult approved. Planning a romantic date in downtown Manchester? Start or end your evening with a private tour. Need help selecting a restaurant or date night activity? We've got you covered! Looking to capture your sense of adventure and love Manchester, NH? We will add to your engagement, lifestyle or just for fun photoshoot. Have you booked your transportation yet? We are the go to alternative shuttle service. Your bridal party and guests will love the additional entertainment and you can attend and leave your wedding with style! Are you a meeting planner with an event in town? Allow Peddl MHT to provide transportation for your VIP guests. Have a special guest in town? We can pick them up at a local hotel and bring them to your office. Coming Spring 2019, learn all about Manchester's history and future. Let's bring your style & Event to life! The best community-oriented method of outreach that people notice and remember! Are you looking for affordable, highly visible, locally targeted, effective advertising? Helps keep pedicabs a reality in Manchester, NH. Pedicabs allow you to directly connect with the age-old "best type of advertising there is": word of mouth. We're not merely rolling billboards; our drivers can be outfitted as rolling brand ambassadors, with the ability to talk directly to your audience. Long exposure time of your advertisement will increase your name recognition by reaching thousands of potential customers at advertising rates lower than radio or newsprint. Let our drivers help you by wearing branded shirts, distributing flyers, coupons, business cards, brochures, or other marketing materials to your target audience at various locations. Contact us now so we can help you. Hire us for the day. For businesses looking to offer sponsored “free rides” for conventions and events we can arrange rides to your attendees, customers and potential clients. With pedicab advertising you can deliver your message in a fun and memorable way. We can work together to execute a campaign. Don’t Just Be Seen…Attract Attention!